FACT CHECK: Can Cellular Calls Cause Brain Hemorrhages? Can Cellular Calls Cause Brain Hemorrhages? Can cell phone calls from particular phone numbers cause brain hemorrhage and death? Claim: Cell phone calls from particular phone numbers can cause brain hemorrhage and death. These numbers come in red colors. U may get brain hemorrhage due to high frequency. 27 persons died just receiving the calls watch the DD news to confirm. Please inform all your relatives and friends soon it’s urgent. Its very important news for all of you. Do not pick up calls Under given numbers. These numbers will come in red color, if the calls comes up from these numbers. Its with very high wave length, and frequency. If a call is received on mobile from these numbers, it creates a very high frequency and it causes brain ham range. Origins: These claims of potentially fatal phone calls have been circulating via email and internet rumor since 2007, and they persist despite the lack of hard evidence about where these supposed deaths occurred. Adding to the fear-mongering are the area codes these phone calls supposedly originate from, which correspond to Middle Eastern countries (most notably Iran and Afghanistan). origins are actually in the Middle East itself. In fact, this warning appears to have started in Pakistan in 2007, spreading first to Afghanistan and then to other countries. It is simply not possible for cell phones to transmit at frequencies that would cause immediate fatalities. This legend depends on a misunderstanding of how frequency waves and resonance work. Sound waves and vibrations can be destructive (consider sound waves breaking glass or the destruction of the Tacoma Narrows Bridge), but circumstances have to be very precise for this to happen. (The University of Salford explains how to replicate the glass shattering effect with sound waves). One key element is volume: without enough volume, sound waves simply do not vibrate glass hard enough to cause destruction. Since cell phones have a limited volume range, this affects their ability to cause damage to the brain. Cell phone frequencies range from 698 to 2155 MhZ, not even enough to pop popcorn. The final bit of this legend that is questionable is the “red number” display. With the exception of user customization on some smart phones, incoming calls are always displayed in black — callers cannot change settings on someone else’s phone simply by dialing their number. 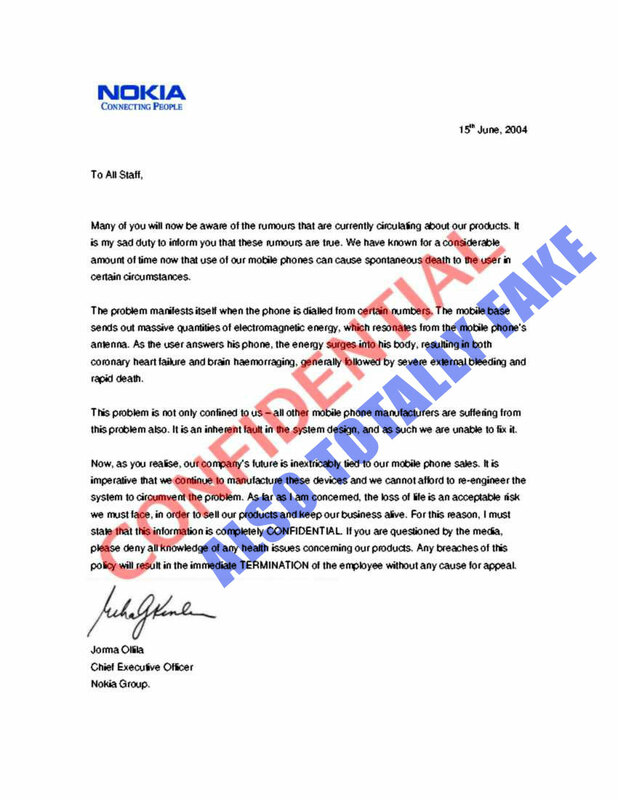 A spokesman for Nokia said: ‘Like many other claims circulating on the internet, this is a hoax. The bogus letter also claims all other mobile phone manufacturers are affected by the same problem. It says it is an inherent fault in the system design and cannot be resolved. Addressed To All Staff and stamped ‘confidential’, the letter has been made to look like it has been leaked from within the company — but the word haemorrhaging is spelt incorrectly. The final paragraph warns staff if they speak to anyone about the letter they will be sacked.